An F-15E Strike Eagle departs Royal Air Force Lakenheath, England, to support Operation Inherent Resolve Nov. 12, 2015. Aircraft from the 48th Fighter Wing deployed to Incirlik Air Base, Turkey, to conduct counter-Islamic State of Iraq and the Levant missions in Iraq and Syria. The dual-role fighter jet is designed to perform air-to-air and air-to-ground missions in all weather conditions. Six F-15E Strike Eagles arrived at Incirlik Air Base, Turkey, Nov. 12 in a demonstration of the United States’ unwavering support to peace and stability in the region. Maintainers inspect an F-15 E Strike Eagle before departure from Royal Air Force Lakenheath, England, in support of Operation Inherent Resolve Nov. 12, 2015. 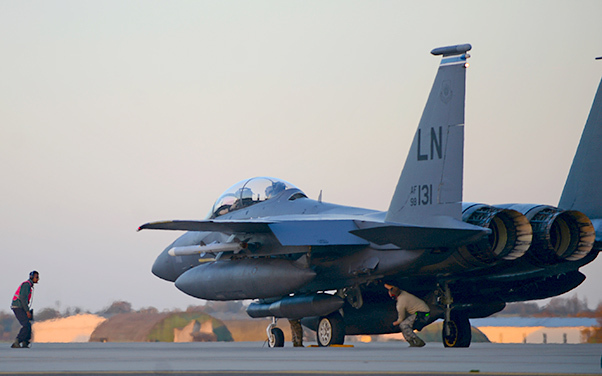 Aircraft from the 48th Fighter Wing deployed to Incirlik Air Base, Turkey, to conduct counter-Islamic State of Iraq and the Levant missions in Iraq and Syria. The dual-role fighter designed to perform air-to-air and air-to-ground missions in all weather conditions. The U.S. Air Forces Europe-Air Forces Africa F-15Es were deployed as part of Operation Inherent Resolve in coordination with the Turkish government and to reinforce our shared commitment to the fight against the Islamic State of Iraq and the Levant in Iraq and Syria. The F-15Es, from the 48th Fighter Wing at Royal Air Force Lakenheath, England, will join U.S., Turkish and other coalition aircraft in supporting OIR and counter-ISIL missions.